One of the best things about fretless bass guitars is their tone. Most luthiers will carefully select a nice mix of body wood and neck material to produce sounds that are warm, woody, bright, smooth, or any of many other common fretless tones. Personally, I prefer the sound of ebony fretboards for fretless, but more woody materials like rosewood are also very common (my first fretless had a sweet rosewood neck). Over time, of course, the friction of the strings against the neck can start to wear down the top layer of the wood. There are specific steps you can take to care for the different woods properly. If you practice solid maintenance from the beginning, you can prevent any uneven wear and tear that may later require repairs or reconditioning. Any sort of wood must be maintained to keep the right look and integrity of the exterior. 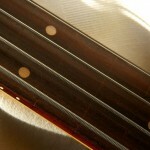 The same goes for basses, both the body of the instrument and the fingerboard. To best care for your fretless, you will need to treat it with some sort of conditioner. 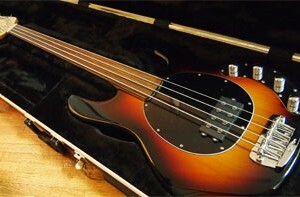 Most bassists will treat their neck and often the body of the bass each time they change their strings. For the body, just polish it with lemon oil or a standard wood polishing product. For the neck, you need to apply the conditioning product to the fingerboard before putting on the new strings. There are a variety of other things you can do once you get more educated about bonding different textures to the neck and the like, but let’s just focus on the basics for today. The cheap and easy way to handle this is to use lemon oil or peanut oil when you change the strings. Lemon oil will help, but I never really thought much of using peanut oil on the bass (too slippery and nearly impossible to remove from the strings/neck if it gets all over the place). If you really care about extending the longevity of your fretless neck, however, you need to look for something a bit more high quality than the run-of-the-mill stuff you get at the grocery store. Here are three products I’ve tried in the past and what I think about them from experience. This is one of the better items on the market today for a price you might actually want to spend (think $10 or less). Basically, this product offers all the positive qualities of lemon oil, which is known to benefit wood preservation and conditioning. The reason I think this product is better than your standard lemon oil, is because they include a sealant in the mix. The sealant is there to help fend off soiling or other materials you don’t want to accumulate on the fingerboard. I find that my ebony fingerboard gets brighter and smoother in tone, AND easier to play with this product. If you like to use lemon oil or want to try it, just get the Dunlop product first. If you’re like me, you won’t want to go back. This product combines multiple conditioning oils plus honey to treat the fingerboard. Although they claim it is great for rosewoods as well as ebony, I found that it seemed to dull the tone on the neck when used on ebony. Maybe it’s just me, or maybe it didn’t work with the bass. Either way, I tried this product originally on my 4-string Warwick rosewood bass several years ago, and it did wonders for the sound on that neck. They claim it can protect against the same grimey stuff as Dunlop, plus sweat and alcohol (rockers, I’m talking to you!). This was a decent product, but not my style on the ebony bass. If you’re on a more grainy wood, it’s worth a try. If you prefer to order larger sized bottles to get a deal, and you want more concentrated conditioning than straight lemon oil, try out this one. Howard brand products are meant to condition furniture, and are offered in different versions for different types of furniture (e.g. outdoor furniture). This is the standard version and the one I’ve heard of folks using. I tried it over at a friend’s one time, but it wasn’t my style. I like to stay as all-natural as possible, and the above two products are more “pure” , or at least appear to be to me. Don’t spot me on what I mean by “pure”, but think “little-to-no-synthetic-chemicals” and you’ll be pretty close. These are the products I’ve tried in the past, but I haven’t tried everything available. Is there a product I haven’t seen yet that you think is worth the readers learning about? Share it in the comments below! Disclaimer: Since all three were available, I linked to the recommended products on Amazon. If you care to try one, please click thru directly from here to purchase it. We use affiliate links to help fund the hosting and administration of this website by the small commission percentage they share for the referral. Thanks for your support! I have had pretty good luck with Tru Oil on a Rosewood fretless fingerboard. I used light steel wool prior to putting the oil on (to remove string marks from fingerboard), then applied 2 coats of TO on the uncoated fingerboard, waited until dry, and then lightly sanded with 1200 sandpaper. I plan on applying a single coat of TO again in a year. What type of inlays? My Green Monster has white fretline inlays, but nothing decorative if that’s what you have on yours. Anything that works on ebony has been fine with my own neck. Let me know and I’ll see if I can help find something for you. Any tips for conditioning a fretless fingerboard that has a ton of inlays all over it?